Now-familiar scenes posted by the Santa Barbara County Fire Department and others this weekend showed Ventura and Santa Barbara counties descending into a nightmarish state, just as with a prior spate of wildfires elsewhere in California earlier this year. Ventura resident Patricia Rye told KEYT she had woken up in the middle of the night after her son-in-law arrived and did not have time to grab anything before the fire approached her building. Elsewhere, CNN reported, thousands of people were evacuated and animals at the Santa Barbara Zoo were loaded into cages in anticipation of a possible emergency. The Thomas fire could be on track to become the largest fire in recorded California history, the L.A. Times reported, potentially surpassing both the 2003 Cedar fire (273,000 acres) and the 1889 Santiago Canyon fire (300,000 acres). UCLA and U.S. Geological Survey research ecologist Jon Keeley told the paper that half of the largest wildfires in the state since 1861 have occurred in the last 15 years, with humans primarily to blame—both as a result of arson or accidental fires being started by them or due to persistent regional drought, which is linked to climate change. “We think that this fire, the Thomas fire, is likely very large in part not just because the Santa Ana wind event is long, but there was this very extreme drought between 2012 and 2014,” Keeley said. 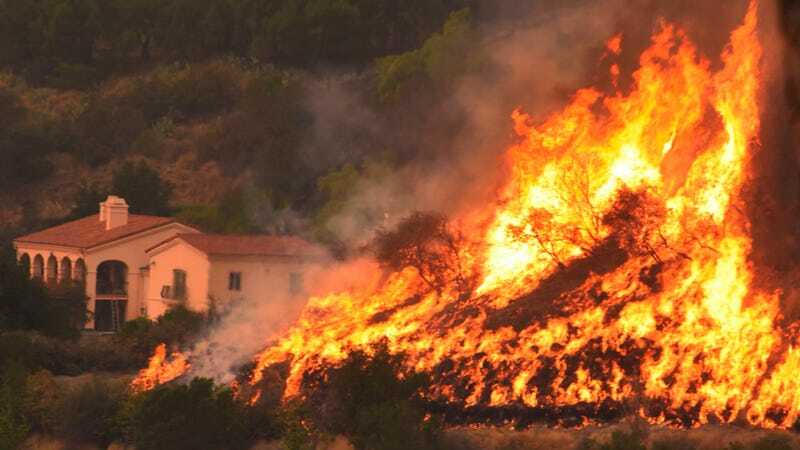 Associate director of the Center for Environmental Journalism at the University of Colorado, Boulder Michael Kodas wrote in the L.A. Times that prior to 1995, the U.S. averaged one “mega-fire” of more than 100,000 acres a year. California now experiences one such fire a year on its own, while the U.S. averages nearly 10. Elsewhere in the paper, concerned readers urged fellow residents to stop building homes or developments in the wildland-urban border zones where the fires spread.